This episode was absolutely packed, unlike any of the other episodes before this. Whether we are talking about the Island flashbacks or the present-time story with Barry Allen, Sebastian Blood and everything else, the episode sets a blistering pace unmatched by any of the previous episodes. Lots of storylines are dealt with here and the acting by every single actor, even the returning Tommy Merlyn actor Colin Donnell got his time to shine in the sun. As the title suggests, and given the holiday season, Ollie does see three ghosts, the ghosts of his friends that he has lost because of the Island: Slade, Shado and Tommy himself. The three ghosts have a message for him and it is this message that is going to galvanise him into becoming even more of a hero than he is. First things first though. The previous episode ended on an absolute cracker: Barry Allen learning that the Vigilante was really Ollie, and that Ollie was on the verge of death. The new episode picks up exactly where the previous one left and we immediately get a ton of intense character tension as Ollie doesn’t trust Barry and this spills over into Felicity giving him a rundown on how he did the same with her and Diggle. Ollie’s answer to that is perhaps one of the best pieces of dialogue in the entire show. He says that it was his choice to reveal his secret, that he controls who gets to learn what he wants. This plays into the larger theme of Ollie keeping the people that he cares about away from him since he can’t protect them and fight criminals at the same time. In a situation like this, his privacy is all he has. Then then moves on to the question of his hallucinations, which he starts having once Barry treats him. This is where the three ghosts of Ollie’s friends come in and it is extremely significant where they appear. Shado comes to him when he is at the mansion. Slade comes to him when he is alone in his Arrow-office. Tommy comes to him when he is fighting Cyrus Gold, the man that Brother Blood has turned into a villain powered by the Japanese Mirakuru serum. Each of the ghosts has a message for Ollie and it is up to him to learn that message. Ever since Tommy’s death in the season finale Ollie has been looking for some kind of a catharsis. He left Starling because he couldn’t bear to live there and face his failure to save Tommy. This has been a running under-theme of the season since the start and it comes full circle in this episode, letting Ollie gain some measure of peace at last. As a fan of both Colin and Tommy, I loved that bit, which seriously shocked me when it came up. In a bit of retrospect, I’d say that that’s actually when my jaw started to drop. You really get a chill when Tommy says his piece. The show sets a new bar with the Island scenes once again. Last time we were there, we saw that Ivo had managed to find the serum, and found Ollie and his friends as well. With Slade dead to the serum’s effects, the three of them are captured and taken away. Not they face a choice. Well, to be more precise, Ollie faces a choice: he chooses who lives and who dies. This sets in motion a chain of events that will eventually bring Ollie back to Starling and he is going to carry the guilt over his decision. What all of this means is that Arrow has never been better. Every moment of this episode is a heartstopper. For the entire time that the episode was playing, I did not move my seat, nor did I want to. I was too busy staring at the screen, taking it all in. One of the most amazing things was how subtly the writers worked in the origins of one of DCU’s most well-known zombie villains, Solomon Grundy himself. Previously we had seen that Brother Blood had turned someone named Cyrus into a Mirakuru-powered villain. This time we see that it is indeed Cyrus Gold, Grundy’s identity before he became a zombie. There are several clues to this in the episode, such as the lines of the Solomon Grundy rhyme that are spoken on the show. The only reason I know that is because I read Matt Kindt’s Solomon Grundy #1 one-shot from DC this September, and that has the rhyme. So damn. Not only is Arrow finally bringing in some super-powered individuals to the show like The Flash and Deathstroke (oh hell yeah, that happened in this episode), but it is increasing the bar yet further with a character like Grundy. How awesome is that? The show started off as gritty and realistic with a good dose of humour now and then. Now it is turning ever so slightly towards the fantastical and really embracing the comic roots. And nothing brings that home like the final few seconds of the episode, where we see Ollie don his mask, created by Barry before he left Starling to be able to get into the presentation for the Central City Particle Accelerator. The Vigilante finally has a mask! And as for Barry, well. His final scene in the mid-season finale is him going through the accident that turns him into The Flash. Again and again the show’s creators have stressed that they are going to handle superpowers very responsibly on the show, that they are going to make sure that nothing is too cheesy, so to speak. Well, I gotta say that they handled both these parts, Ollie’s mask and Barry’s accident, responsibly. There are reasons and proper setups for everything. Finally, in this episode, Ollie gained a new villain, someone that was long expected on the show given how everything else has panned out. In all, that makes Ollie the target of three important villains from the DCU, and I can’t wait to see how the second half of the season deals with everything. The acting, as I’ve said before, is on the money in every single respect. Sadly, we don’t get to see Summer Glau’s Isabel Rochev anywhere, but we see pretty much all the rest of the recurring cast. Grant Gustin as Barry continued to impress and I have to say that despite some initial reservations, I’m definitely on board with him now. His cheerful manner really gets to you and its a selling trait here. He is getting his own series next year and I expect Gustin to do even better there. The award for the best acting in this episode definitely goes to Manu Bennett however, playing Slade Wilson. Heart-pumping action all throughout and not a moment of boredom, even with Katie Cassidy’s Laurel, who got sort of a weird half-scene where Sebastian Blood was apparently soft on her and sent her flowers and she later helps him with his Christmas shopping. I say weird because there hasn’t been any set-up at all for this, but it can prove interesting, depending on how the writers handle that, and so far they haven’t really disappointed. Not much. All I can say is that the awesomeness in this episode was on a whole different level than any other episode of the show. It was the perfect place to end for the mid-season break and there’s going to be a lot of talk about it in the month that follows now. 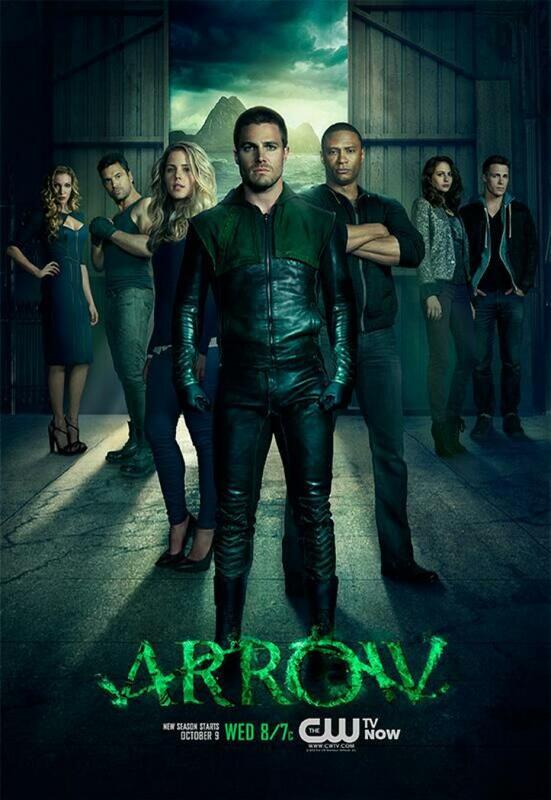 More Arrow: S2E01, S2E02, S2E03, S2E04, S2E05, S2E06, S2E07, S2E08. Posted on December 13, 2013, in Arrow, Review Central, TV Show Reviews and tagged Arrow, Barry Allen, Brother Blood, Colin Donnell, CW, David Ramsey, DC Comics, Deathstroke, Emily Bett Rickards, Felicity Smoak, Grant Gustin, Green Arrow, John Diggle, Manu Bennett, Oliver Queen, Professor Ivo, Review Central, Sara Lance, Sebastian Blood, Shado, Slade Wilson, Starling City, Stephen Amell, Superheroes, Supervillains, The Flash, Tommy Merlyn, TV Show, TV Show Review. Bookmark the permalink. Leave a comment.